You may have heard of birthstones or read about them when looking at jewellery online. But what are birthstones and more specifically what is the birthstone for January? That’s a good question! Birthstones are in fact gemstones that represent the month in which someone is born. With this in mind, there are twelve different types of birthstone and the gemstone that is commonly referred to as the January birthstone is actually the garnet gem which is commonly a deep red colour. 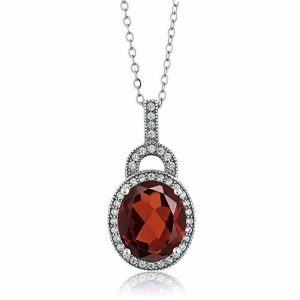 Read on to find out about our top ten items of jewellery that feature the stunning garnet birthstone! Garnet gemstones are silicate minerals which have been used as decorative gemstones for almost 5,000 years, as far back as the bronze age. Whilst species of garnet can be found in a range of colours the most famous type of garnet gemstone is a deep shade of red. This is in fact where this gemstone gets its name from as it originates from the 14th century word for ‘dark red’. Other colours of garnet include green, pink, orange, black and colourless. There is even a garnet gemstone that is known to change colour in different light! But the most famous (and our favourite) is of course the deep red garnet. Garnet gemstones are commonly located in Spain, Italy, Kenya, Mexico and Russia. You may think that these gemstones are simply a pretty gem that can be used for jewellery, however these gems actually have a range of uses. Another common use for the garnet is as an industrial material for cutting, blasting and for filtration. Another interesting fact is that the garnet is commonly believed to have a positive influence over a person’s success, popularity, creativity and love, so you’re getting a lot for your money! Garnets are also known to be very attractive gems which have a similar structure and physical characteristics to crystals. 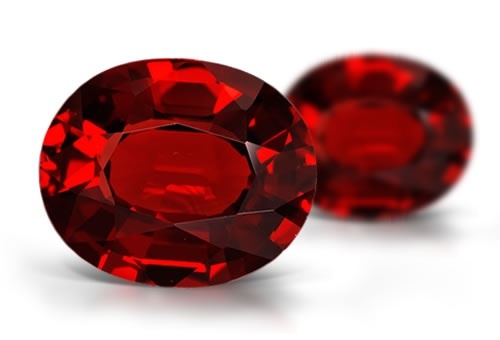 As with diamonds, it is often recommended that before buying your garnet gemstone it is important to consider the four C’s which are the clarity, colour, carat and cut. Perhaps the most important feature for our top ten list is the colour, which is most commonly going to be deep red. When it comes to cut, there are a variety of shapes that you may want to choose from including round, oval, heart and cushion. The clarity will also have a large impact on the cost of the gemstone and garnets are often chosen because they do not contain inclusions, so are a very clear gemstone. With regards to carat, this will again have a large impact on the price and the value of the garnet will often increase with size. The overall choice however will very much depend on your style and what you prefer! When choosing your garnet gemstone it is important to take time to consider whether you would like a natural or created gemstone. In either case, you may want to take some time to research and look at the gemstone before purchasing as there is a risk that you may purchase a fake garnet. Our top tips to avoid being cheated would be to remember that a real garnet will display a rainbow of green and yellow bands when held close to your eye. A real garnet is also high in clarity so will not display clouding or blurring. Furthermore garnet gemstones are known for their hardness and can scratch steel but they are in fact resistant to scratches from steel. But please be careful, we wouldn’t recommend necessarily testing your gemstone by trying to scratch it! Once you’ve chosen you garnet gemstone, you’ll want to know how to keep your garnet gemstone clean. Start by scrubbing it with a soft bristle brush in warm, soapy water. This will help to cut through any grease on your ring and also help to bring your gemstone to a shine. Please consider the metal used in your jewellery as it may require different cleaning methods to get the metal shining just as well as the garnet. To maintain a garnet’s lovely colour and shine, it’s often advised that you clean it regularly using the above approach. You may also want to use a polishing cloth to maintain your garnet’s shine and sparkly appearance. It is however best to avoid any steam cleaning machines to clean your gem as this can weaken the gemstone and cause cracks within the gemstone. Similarly, it’s very important that you do not expose your garnet gemstone to extreme heat as this can also damage the gemstone. In terms of storing your garnet gemstone, it’s important that you store it in a pouch or box. You may want to store your garnet gemstone in a jewellery box which is also a good option, however you will want to ensure that it is a felt lined jewellery box to avoid any damage. Here are some of our favourite January birthstone pieces for you to enjoy. 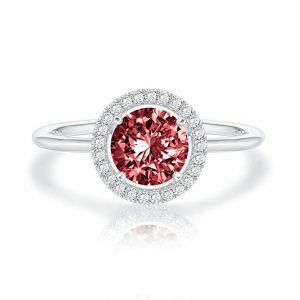 The first choice in our top 10 list of January birthstone jewellery is a must have item that you’ll love! 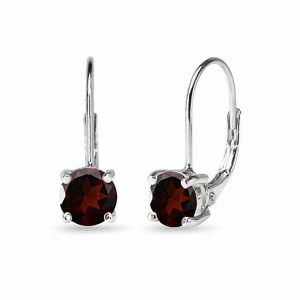 These sterling silver earrings feature a beautiful created round cut garnet stone and offer the perfect option if you’re looking for your first piece of garnet stone jewellery. One of the things we love most about garnet stones is the deep red colour and these earrings show the garnet stone in all their glory. These beautiful round gems are set in a simple four prong setting and the sterling silver metal that is used is a fantastic pairing for the bright red gemstone. These stud earrings are fairly small in size however due to the sparkling red gems they are sure to catch people’s attention. The gems are 1.73 carats each so are certainly large enough to stand out. They are also the perfect accompaniment to your outfit, whether you’re dressed for a night out or for an informal occasion. These earrings are part of the Amazon Essentials collection so you know that you’re buying from a reputable source and you’ll have peace of mind with Amazon’s high quality customer service. Amazon are proud to state that their Essentials collection benefits from them having taken into account customer reviews in order to make the items more comfortable and better quality. Another thing that we really like about this item is that you have the option to tailor your earrings by choosing from 12 different coloured gemstones. There really is one for every birthstone! Whether you choose from white sapphire, aquamarine or even emerald, we’re sure that you won’t be disappointed with your choice. However our favourite out of the selection has to be the stunning garnet gemstones which are the ultimate way to show off the January birthstone. These earrings have a simple butterfly backing so they are easy to take on and off and you’ll receive your earrings in a lovely deluxe jewelry box, another benefit with purchasing this item from the Amazon Essentials collection! Our next piece of jewelry that shows off the garnet gemstone in all its glory is a beautiful stirling silver ring. This ring includes an extremely pretty oval garnet stone that will truly catch your eye and one that will make the perfect accompaniment to your wardrobe no matter what you are wearing. The band of this ring features an elegant design that incorporates a heart on each side of the gemstone that weaves into the band. This is the perfect setting in which the garnet gemstone is set and is a very pretty ring on the finger. We actually think that this item looks a lot more expensive than its modest price tag which is another bonus! The oval garnet gemstone is held in place by a simple four prong setting which holds the gem above the finger and gives the ring a nice depth. In terms of the size, the gemstone is 0.55 carats so will look great with other jewellery and doesn’t look too large on the finger. Although the top of the band is highly decorative, the sides and bottom of the band are smooth which will add to the comfort of this ring and give it a nice feel to wear. This ring is made by Gem Stone King and if you’ve read any of our previous reviews you’ll know that this is a reputable and trustworthy brand that makes a selection of high quality jewellery items. Your ring will even come with a lifetime warranty included and if you have any problems with your ring you can return it for a free refund. That’s what we like, a company that truly cares for its customers! This next item proves just how versatile the garnet gemstone is. These terling silver dangle earrings feature three beautiful garnet stones which are all held in place with a simple four prong setting. With these earrings you’re getting a lot of gemstone for your money with the centre gem coming in at 0.96 carats and the twin gemstones that sit either side of the larger garnets weighing slightly less at 0.51 carats. Although there are six gemstones in total (three on each earring) they are a comfortable weight and not too heavy. One of our favourite features with these earrings is the way that the gems are attached to the upper earring and the small hoops that connect the lower section allow the earrings to dangle beautifully. If dangly earrings are your thing, you will not be disappointed! You’ve got peace of mind that your earrings will remain in place as they include a secure lever back closure which also means that these earrings are very comfortable. This is another item of jewelry which is part of the Amazon Collection so you will receive your earrings in a classic jewellery box to keep them safe. You can even choose to purchase these earrings in one of any of the twelve birthstones so you could have a pair for every occasion! We’ve already said how we love the versatility of the garnet stone and how well it can be worn in so many different styles. This couldn’t be more true with our next item which includes a round brilliant cut garnet gemstone. 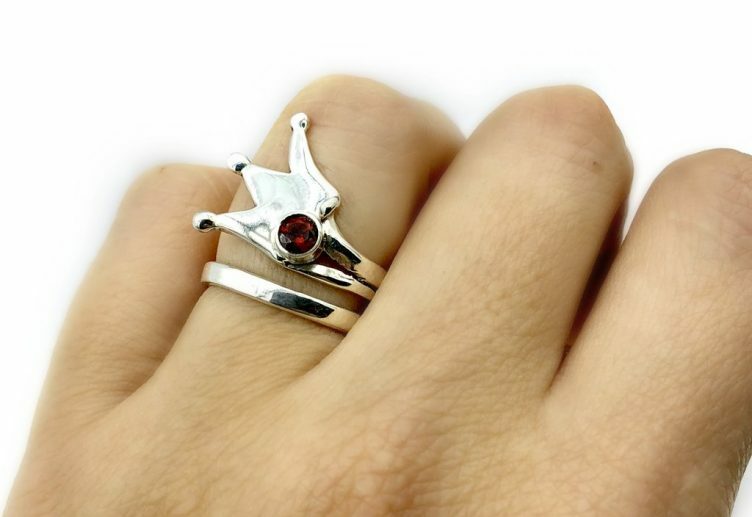 When worn on its own, the garnet gemstone is a stunning gem that is very pretty and with this ring the gemstone is even more attractive due to it being surrounded by Swarovski crystals. The garnet in this ring is set in place with a simple four prong setting which elegantly holds the gemstone above the band. Surrounding the large gemstone are a selection of Swarovski crystals which offer the perfect back drop and the bright, sparkly crystals complement the garnet gem very well. The band of this ring is actually made from brass and plated in 14 carat gold which gives the ring a very attractive polished look. One of the things that is quite different to many other rings is that it is adjustable by pinching the ring together or pulling it further apart. This results in the ring looking quite different to a traditional ring design and instead of the band forming a complete circle, there is a gap between the two ‘ends’ of the band that can be squeezed together to adjust the size of the ring. If you’re worried about how this may look then don’t worry too much because when the ring is worn the gap cannot be seen as it sits on the underside of the finger. We actually quite like this design and the addition of the two balls on each end of the ring give this quite a unique look. This is a stackable ring which means that you can stack it with other bands but the great thing with this ring is that it also looks great on its own. Overall we are very impressed with such an attractive ring for such a reasonable budget! Our next item is a must have if you’re looking for a gift for Valentine’s Day or to show your love for that someone special. This birthstone necklace positions a beautiful round, brilliant garnet gemstone at the heart of the necklace which is very pretty. 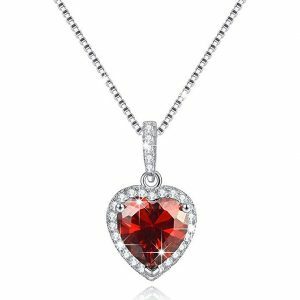 The gemstone sits within a sterling silver heart shaped design which contains twelve Swarovski crystals along one edge. This helps to brighten the necklace and adds a little sparkle which works well with the deep red of the garnet gemstone. 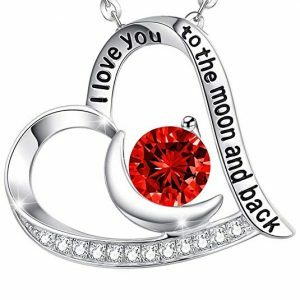 The necklace also contains a quote along the opposite edge to the crystals which reads “I love you to the moon and back”. How romantic! One feature that we love with this ring is that at the centre of the necklace and holding the garnet stone in place, the silver has been shaped into a moon which works perfectly with the quote (to the moon and back!). The necklace also comes on an adjustable 18inch rolo chain which can be adjusted by up to two inches depending on what feels comfortable. The designer of this ring, Edla&Co who offer a money back guarantee, however we are sure that you won’t be disappointed with this necklace! It even comes in a gift box so it will be ready to keep safe or to give to a loved one. Sometimes it’s best to let the gemstone do all the talking and that is particularly true with this stirling silver necklace which is available from the Amazon Essentials collection. 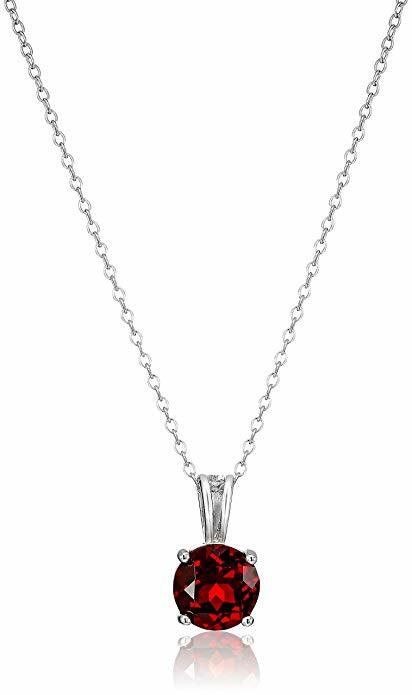 This necklace includes a 2.4 carat garnet stone that is absolutely stunning! The design is very simple and clean which means that your eye will be automatically drawn to the deep red gemstone. Held in place by a simple prong setting, the garnet gem is the main attraction with this necklace and we particularly like the simple attachment that holds the pendant in place. This necklace is made from sterling silver and is rhodium plated so looks very shiny which is a great accompaniment to the garnet gemstone. The style of chain is also very well matched with the gemstone and the smaller hoops of the chain help to keep the focus on the larger gemstone. This is yet again another quality piece of jewelry which is offered by the Amazon Essentials collection. We love the stylish box that this item comes in and it’s clear that you are getting a lot of necklace for your money! Perhaps a recurring theme with our selection of garnet gemstone jewellery is just how beautiful this gemstone is and how well it works as part of a simple piece of jewelry. If you’re looking for a pair of earrings that scream simplicity then we’ve found what you are looking for! These sterling silver earrings feature a leaver back design which is comfortable to wear, sturdy and easy to put on and take off. The leaver back design really adds to the look of these earrings and helps to give this an extra element of finesse. 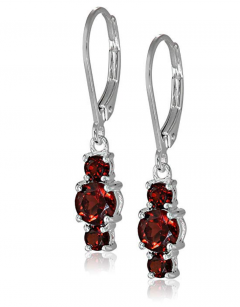 Once again the design of the earring builds on the beauty of the garnet gemstone and makes the garnet the centrepiece. These gems are a natural, round garnet gemstone that come in at a whopping 2.20 carats so these earrings will look fantastic no matter what your outfit! We love the small touches with these earrings, including the pouch that your earrings arrive in. This is a great feature that the designers of this ring, GemStar USA, offer with their range of jewellery. This is another piece of jewellery that comes in at a very reasonable price and looks great for an extremely competitive price. These earrings are a bargain! We’ve already discovered that garnet gemstones work very well with bright, sparkly crystals and this necklace proves it again! 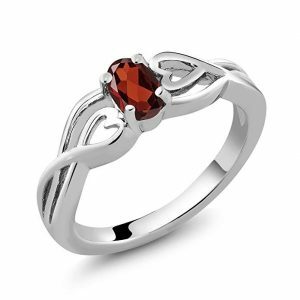 This is quite a unique design and the garnet gemstone has been lovingly shaped into a heart that sits at the centre. This garnet would probably look great on its own, but the designers have taken this necklace to the next level by surrounding the gemstone with dozens of sparkly crystals. This helps to set the garnet gemstone and gives it that extra sparkle. Made from sterling silver, the chain works really well with the pendant which is attached via a small hoop which continues the crystal design. The chain comes in at 17.7 inches so sits comfortably on the neckline. The designers, BSTONE, also make it clear that this necklace has gone through rigorous testing to ensure that it is nickel, lead and cadmium free which means that this is free from harmful substances and should be relatively safe to wear if you have sensitive skin. We love that this necklace comes in 12 different varieties so you have a choice from any of the birthstones depending on which you prefer. After taking a look at the 11 other necklaces we can assure that they are all lovely pieces of jewellery however our favourite has to be the January birthstone which is the perfect centrepiece for this beautiful necklace! 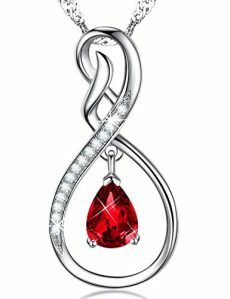 Continuing our theme of perfectly matched garnet gems with Swarovski crystals, this infinity necklace is a stunning piece of jewelry. At the heart of this necklace is a round, brilliant cut garnet gem that is a beautiful deep shade of red. We really like how the garnet gemstone is held in place as it has the appearance that it is almost floating above the pendant which further adds to the elegance of this piece. Along each side of the pendant, this necklace features 24 smaller Swarovski crystals which brighten the necklace up and add that extra sparkle. This necklace features 18k white gold which is plated over Sterling silver and the chain is a really nice length at 18 inches, with the option to extend by another two inches depending on your preference. One thing that we especially love with this necklace is that there are two styles available and it comes with either a Singapore or Rolo style chain. Both look very pretty with the pendant, but our favourite has to be the Singapore style that adds that extra level of elegance. It is however worth noting that the style of chain that you receive is randomly selected and it is not possible to select your preference. This may be an important consideration for you if you have a particular style in mind. The supplier of this necklace, Elda&Co, provide a money back guarantee if you’re not happy with your purchase but we’re sure that you will be pleased! What’s not to love? The final choice in our top ten picks of January birthstone jewelry has to be one of our favourites. This necklace features a 5.6 carat oval cut natural garnet gemstone. Yes, you read that correctly, 5.6 carats! For the price tag on this necklace you are getting a lot of gemstone for your money and this really is a beautiful garnet gemstone. As with many of the necklaces in our shortlist, the gemstone is surrounded by smaller crystals which sparkle beautifully and help to draw the eye. On this necklace, the smaller crystals are in fact cubic zirconia and there are 41 individual gems on this necklace that continue around the garnet, also covering where the pendant meets the necklace. It’s very glitzy! The chain on this necklace is 18 inches and the thin closed hoop design complements the pendant very well, giving this item of jewellery a very dainty feel. The chain is fastened by a spring ring clasp which may prove to be a little more fiddly to put on and take off. However the benefit with this style of clasp is that it will remain secure and is less likely to come loose from your neck. This is another necklace that has been lovingly designed by Gem Stone King who have been making and designing jewellery since 1903, so they know a thing or two when it comes to necklaces!